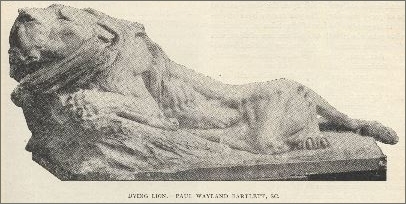 Walter S. Arnold, Sculptor/Stone Carver, Chicago, Illinois. “Artistry of the Early American Stonemason,” January 22, 2015, presented by Old Stone Houses. 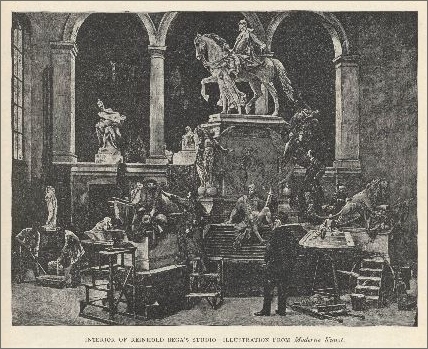 Reinhold Begas, Berlin, Germany – “Inside Bega’s Studio” (located in Berlin, Germany), in The Monumental News, June 1895. This article contains a photograph of the main part of Reinhold Bega’s equestrian group of Emperor William I, the national monument in Berlin. The “socle on which the group is to stand” was made of granite, although the source of the granite is not specified. Tom Blatt, Sculptor and Painter, Brooklyn, New York. Don Dougan, Sculptor, Atlanta, Georgia. Early Stone Cutters in Western Missouri, A Research Study From Jones-Seelinger-Johannes Foundation, Butler, Missouri. Gary D. Grossman, Sculptor, G. Grossman’s Fine Art - Visit Gary Grossman’s web site to view photographs of California soapstone, Colorado alabaster, Kansas Tuxedo limestone, Kansas Cottonwood limestone, Virginia steatite, Wisconsin sandstone, Nova Scotia blue anhydrite, and Brazilian soapstone. This post trip activity document includes the following sections: Background information on Georgia granites and granite-gneisses, Historical Overview (Quarrying on Stone Mountain, the Stone Mountain granite Company, the Stone Mountain Granite Corporation, wages for quarrymen, the stone cutters’ union), Quarrying Methods, Sources, & Crystals, Minerals, and Rocks. Gary McWilliams, Marble Carver and owner of Stone Arts of Alaska, in Craig, Alaska, & Bellingham, Washington. According to the web site, the stone sold by Stone Arts of Alaska comes from the coastal area islands of southeast Alaska. Visit the web site to view finished pieces made from the Aphrodite Marble, Jupiter Marble, Prince of Wales Greenstone, and many other Alaskan stones. Several of these stones contain fossils. His account of his discovery of Jupiter Marble is especially interesting: “Marble on the Edge,” by Gary McWilliams, Stone Arts of Alaska. Robin Putnam, Stone Carver, Carthage, Missouri. Stone Carvers – “What is a stonecarver?” – Thoughts by Patrick Plunkett, on the Stone Carvers Guild web site. Stone Workers & Their Families in American Life Histories – Manuscripts from WPA Writers’ Project (1936-1940), Library of Congress – American Memory. The Stonesetters – The Men Who Built the University (Duke University Archives, Durham, North Carolina). This site tells the story of Louis Fara, a native of Frugarola, Italy, and the other stone masons of his era who help to build Duke University. Click here for information on Duke Stone. 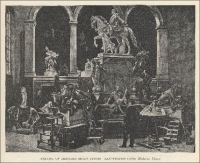 “What French Sculptors Think of American Sculptors” (in 1895), in The Monumental News, May 1895.